Here at DIBS for Kids we love finding new and exciting ways to deliver books to students. One of the things we support teachers to do is create classroom culture around reading with the hope that the love of reading will transfer to the home. Enter: Dewey’s Book Club. What is Dewey’s Book Club? (We deliver 30 identical books to a classroom for students to check out and read. These books cannot be found in the DIBS bins otherwise, so it gives students a unique opportunity to check out a book they haven’t seen before). (We designed a unique activity for each Dewey’s Book Club book. This is the piece that builds community reading). In a time driven by technology, we often find ourselves disconnected. Building a community of reading can combat this. 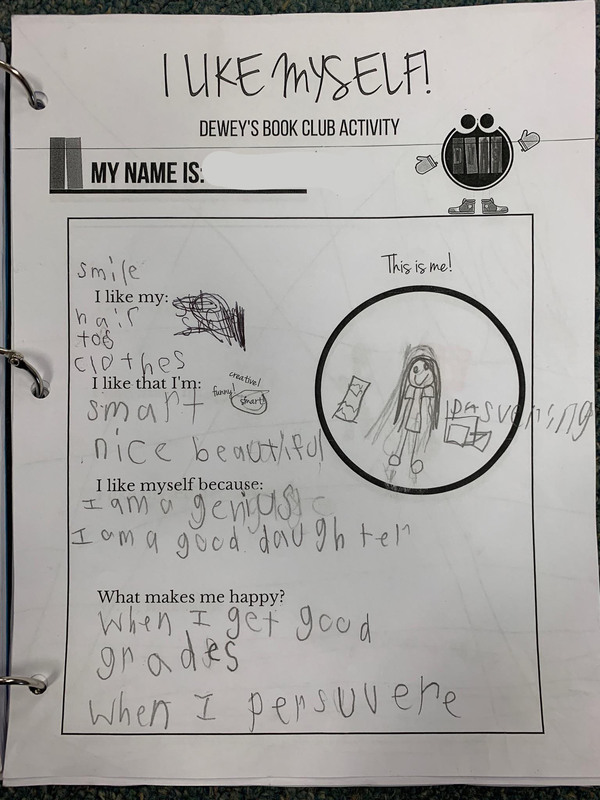 A blog post from Teach Like a Champion reminds us not everyone views books the same and how reading together can reconnect people by discussing experience and providing perspective. We have sent our Dewey’s Book Club books home with 10 DIBS classrooms during this first semester of the school year. These six unique book sets are all different reading levels, so all grade levels can enjoy and utilize them. In choosing these books, the DIBS team selected home run books the kids would love with messages and lessons the teachers and parents could get behind. Our six current titles are I Like Myself by Karen Beaumont, Pete the Cat (I Love My White Shoes) by Eric Litman, The Big Umbrella by Amy June Bates, Press Here by Herve Tullet, There’s a Bird on Your Head by Mo Willems, and Please, Open this Book! by Adam Lehrhaupt. 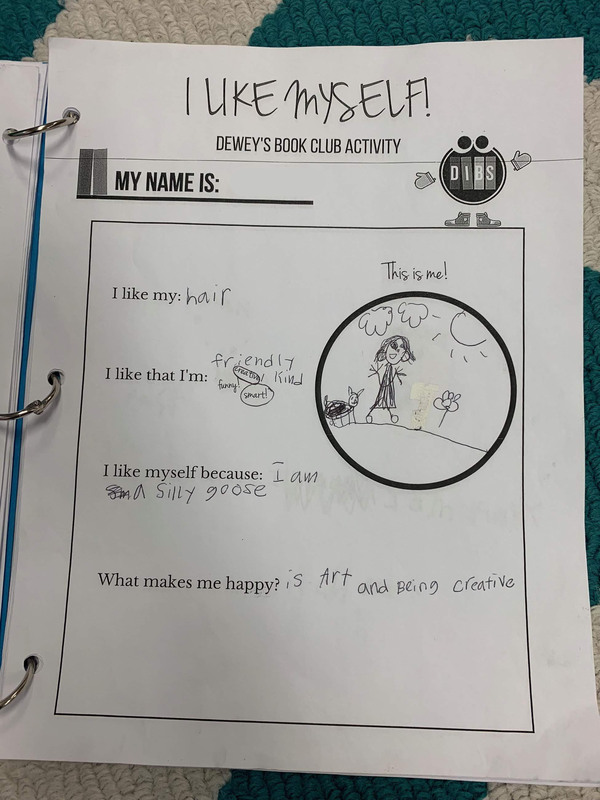 My personal favorite of these books is I Like Myself, a hit with our second grade classrooms. I Like Myself uses quirky rhymes and whimsical illustrations to build a narrative of self-confidence and self-worth. This book demonstrates that it is okay and wonderful to be exactly who you are and to not care what others think. 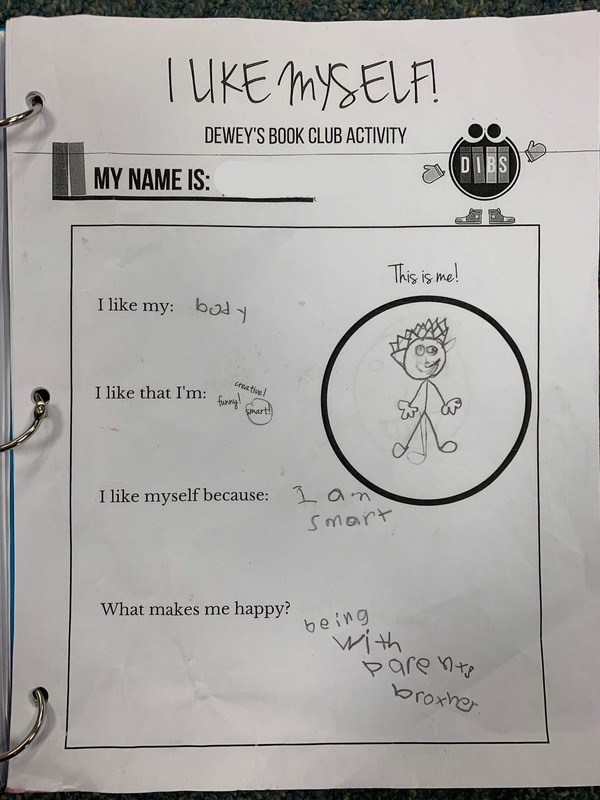 With this message in place, we created an activity where students can explore what they like about themselves by drawing pictures and writing their favorite traits or characteristics. One of our DIBS teachers went above and beyond our expectations with this activity. Ms. Andreas utilized the activity we provided by creating a study project around this book. Each of her students completed the activity and she compiled all of their responses into one binder. Here at DIBS we absolutely love and appreciate the level of engagement this teacher has with the program. Utilizing the activity to this level surely creates a sense of community in the classroom. Not only can this level of commitment contribute to a sense of community, we have found that it can re-engage some students that have distanced themselves from reading their DIBS book at home. Although not a silver bullet for increasing overall participation in the program, its is still a great way to re-connect with individual students. Overall, Dewey’s Book Club is a fun and new way for students to experience DIBS, and we hope they enjoy it as much as we do! Hi! My name is Rachel and I currently serve as an AmeriCorps VISTA at DIBS for Kids. I am a recent college graduate from the University of Wisconsin-Madison (Go Badgers!!!! ), and plan to continue my studies as a law student next Fall. In my free time I enjoy listening to music, going to concerts, and binge-watching critically acclaimed TV shows. Working so every Pre-K through 3rd grade kid in Omaha can read a book every night, at home, for fun.